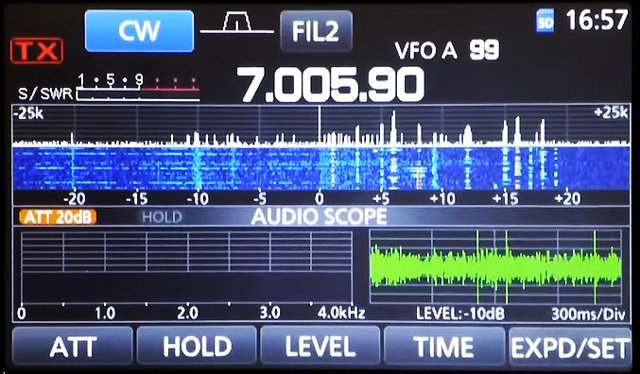 The IC-7300 is the first direct-sampling/DUC SDR transceiver from a Japanese amateur radio manufacturer. Fig.1: IC-7300 front view. Click for larger image. 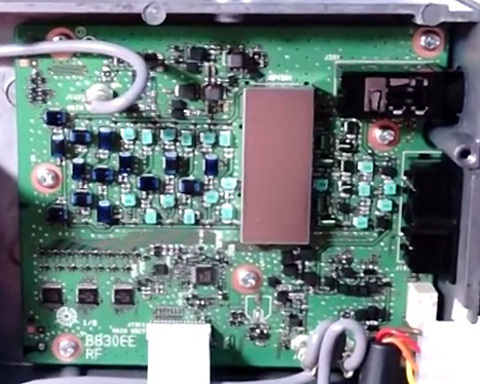 Courtesy Icom Inc.
Fig.2: IC-7300 rear panel. 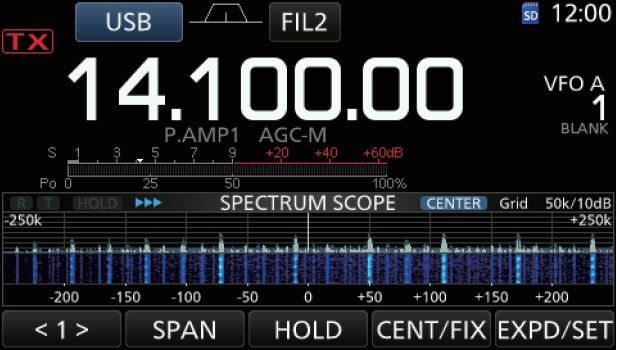 Courtesy Icom Inc.
Fig.3: IC-7300 spectrum scope screen. 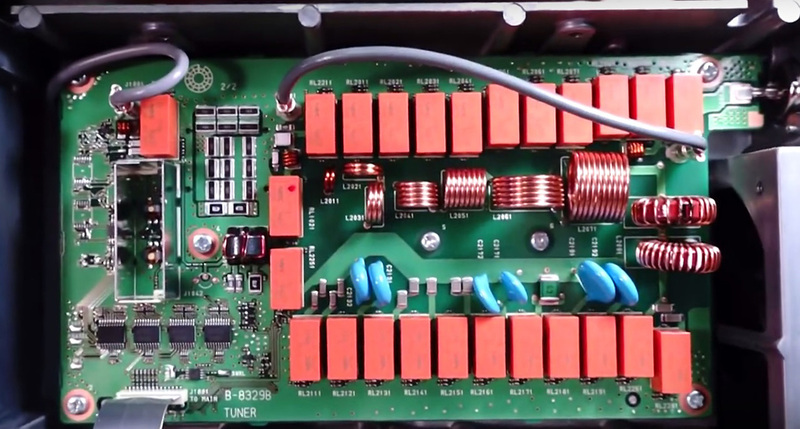 Courtesy Icom Inc.
Fig.4: IC-7300 autotuner. 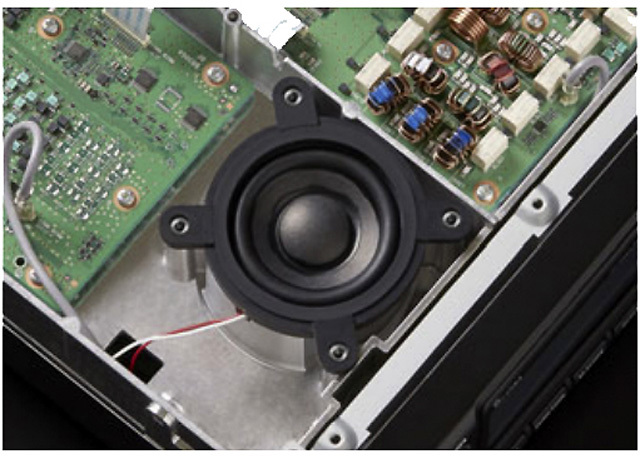 Courtesy Icom Inc.
Fig.5: Internal speaker, baffled by die-cast chassis. 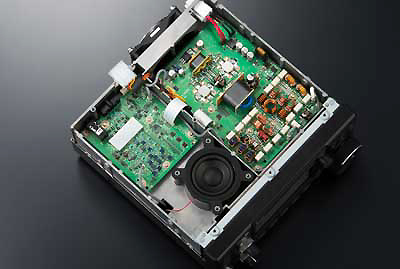 Courtesy Icom Inc.
Fig.6: Top interior: RF, PA Units. Courtesy IØGEJ. Fig.7: Bottom interior: ATU, Main Unit. Courtesy IØGEJ. Fig.8: Simplified IC-7300 RX & TX block diagram. Courtesy Icom Inc.
Fig.9: IC-7300 RMDR & phase noise curves. Courtesy Icom Inc.
Fig.10: Audio spectrum analyser/oscilloscope screen. Courtesy IØGEJ. 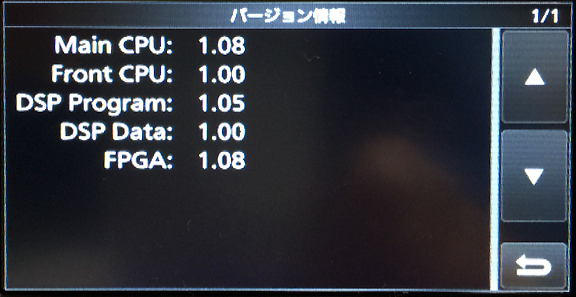 Fig.11: Firmware upgrade screen*. Courtesy JP7GRU. Fig.12: Band/frequency entry keypad menu. Fig.13: Frequency change on touch-screen. Courtesy IØGEJ. 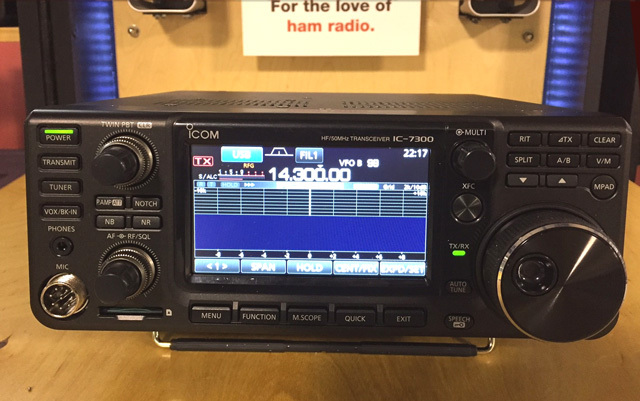 Fig.14: The IC-7300 at Orlando HamCation 2016. 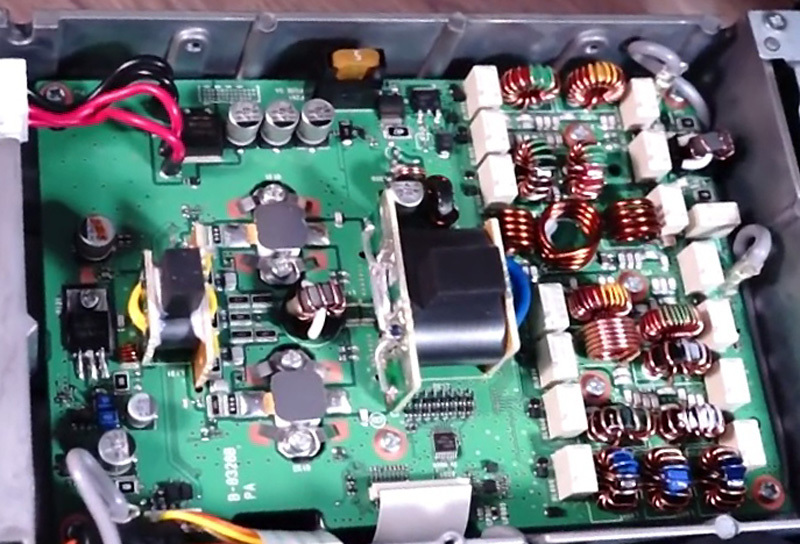 Courtesy Icom America Inc.
Fig.15: Audio SA & scope, at Orlando Hamcation. Courtesy IØGEJ & AB4BJ. Fig.16: Screenshot capture (NPR test). 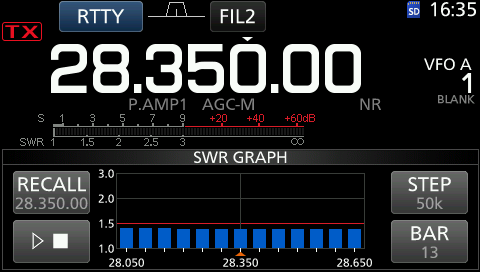 Fig.17: Screenshot capture: SWR graph, 75Ω load. 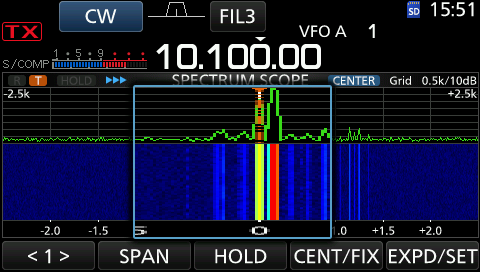 Fig.18: Screenshot capture: Spectrum scope resolution BW ≤ 50 Hz. 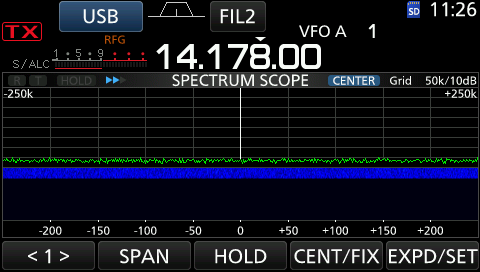 Fig.19: Spectrum scope with Dave N9EWO's settings. Click for PDF. ADC: Linear Technology LTC2208-14. 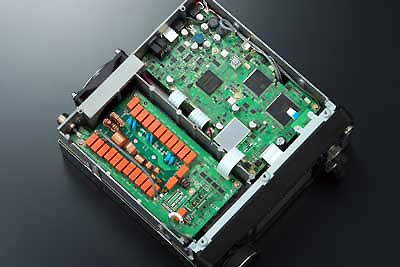 ADC driver: Linear Technology LTC6401-20. 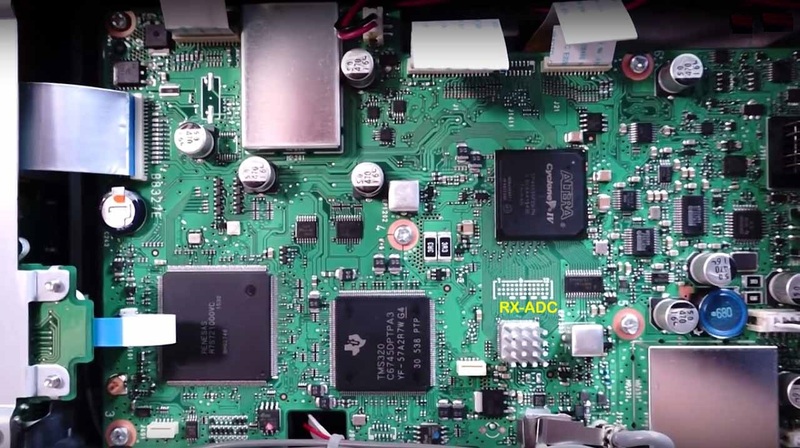 FPGA: Altera EP4CE55F2317N. DSP: TI TMS320C6745 (375-456 MHz, low power consumption). DAC: Intersil ISL5857IAZ. Rear-panel SEND and ALC RCA jacks. ALC control voltage 0 ~ -4V. ALC input resistance 3 kΩ. Compact size: 240(W)×238(D)×95(H) mm, 4.1 kg. 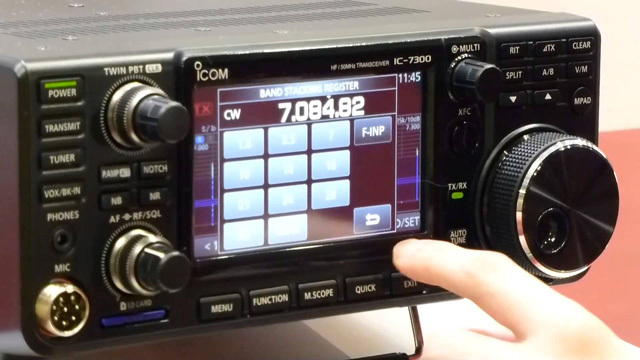 The latest IC-7300 firmware release is V1.30 (20 July 2018). This feature improves the receiver IMD (Intermodulation Distortion) by making the best use of the direct sampling architecture. 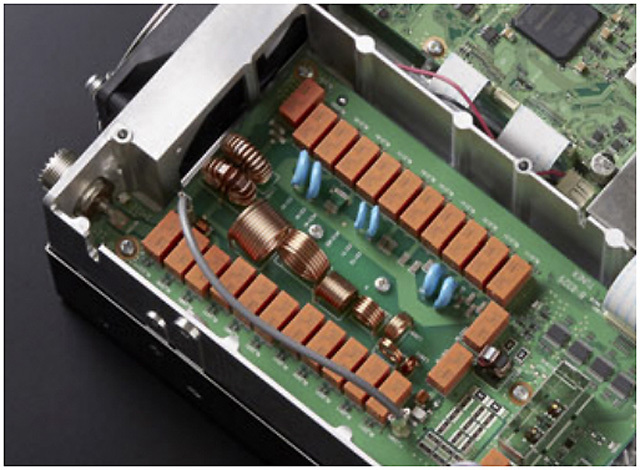 It optimizes the level of the ADC (Analogue/Digital Converter) for strong input signals in order to reduce distortion. 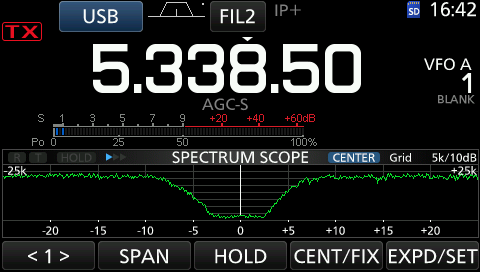 It also minimizes the reduction in sensitivity for weak signals and improves IP3 (3rd order intercept point). Fig.20: IP+ Softkey. Courtesy Icom Inc.
Every touch toggles the IP+ feature ON or OFF. ON for better IP (linearity), OFF for better sensitivity. Fig.21: IP+ Indicator. Courtesy Icom Inc.
Push EXIT to close the FUNCTION window. The IC-7300 IP+ (Intercept Point Plus).feature activates on-chip Dither and Randomization in the ADC. 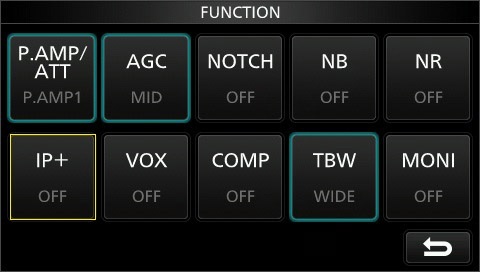 IP+ has two selectable modes; ON (optimum linearity) and OFF (optimum sensitivity). 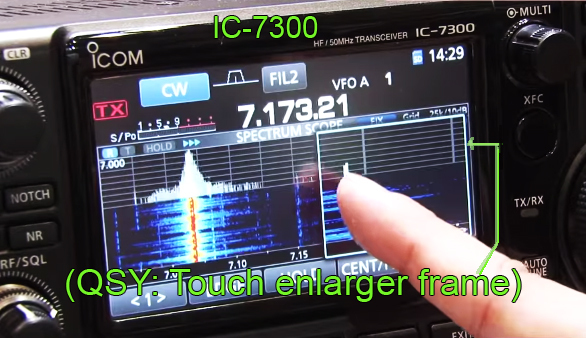 Video: The IC-7300 at Tokyo HamFair 2015. FCC ID: AFJ376500, granted 24 February 2016. Copyright © 2015-16 A. Farson VA7OJ/AB4OJ. All rights reserved. Images: contributors as noted.